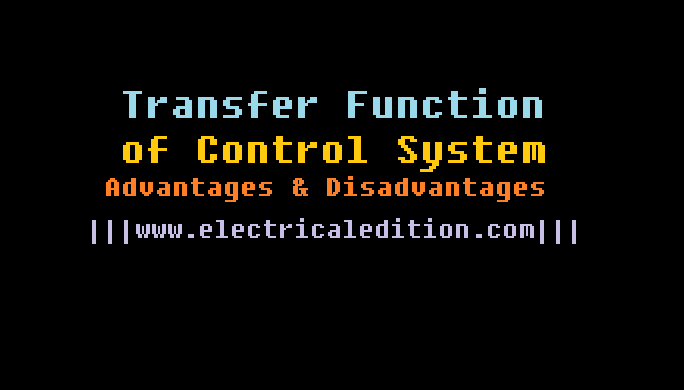 What is Transfer Function In Control System ? Definition: Mathematically it is defined as the ratio of Laplace transform of output (response) of the system to the Laplace transform of input (excitation or driving function), under the assumption that all initial conditions are zero. Symbolically system can be represented as shown in the below figure where input is represented as r(t) and output is represented as c(t) and the transfer function of the system is C(s)/R(s). C(s) ---- Laplace transform of output. R(s) ---- Laplace transform of input. i) It gives mathematical models of all system components and hence of the overall system. Individual analysis of various components is also possible by the transfer function approach. ii) As it uses a Laplace approach, it converts time domain equations to simple algebraic equations. iii) It suggests operational method of expressing equations which relate output to input. iv) The transfer function is expressed only as a function of the complex variable ‘s'. It is not a function of the real variable, time or any other variable that is used as the independent variable. v) It is the property and characteristics of the system itself. Its value is dependent on the parameters of the system and independent of the values of inputs. 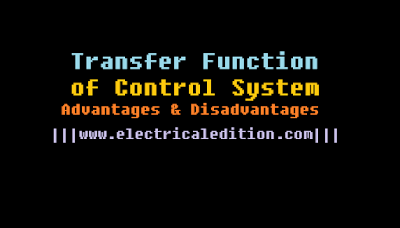 Transfer function is to be obtained for a pair of input and output and then it remains constant for any selection of input as long as output variable is same. it helps in calculating the output for any type of input applied to the system. vi) Once transfer function is known, output response for any type of reference input can be calculated. vii) It helps in determining the important information about the system i.e. poles, zeros, characteristic equation etc..
viii) it helps in the stability analysis of the system. ix) The system differential equation can be easily obtained by replacing variable 's' by d/dt. x) Finding inverse, the required variable can be easily expressed in the time domain. this is much more easy than to analyse the entire system in the time domain. i) Only applicable to linear time invariant systems. ii) It does not provide any information concerning the physical structure of the system. From transfer function, physical nature of the system whether it is electrical, mechanical, thermal or hydraulic, cannot be judged. iii) Effects arising due to initial conditions are totally neglected. Hence initial conditions loose their importance. 1) Write down the time domain equations for the system by introducing different variables in the system. 2) Take the Laplace transform of the system equations assuming all initial conditions to be zero. 3) Identify system input and output variables. 4) Eliminating introduced variables, get the resultant equation in terms of input and output variables.